On my way home from work today I heard an odd rhythmic scraping from my rear passenger drum. I pulled the drum off and found a rock had worked its way into the lip at the edge of the drum. However, while I had it apart, I noticed the auto-adjuster had worked its way back to zero. Now, correct me if I'm wrong, but aren't they only supposed to go in one direction? I wonder if I might not have something installed wrong. E.g. maybe I have the brakes mirrored. 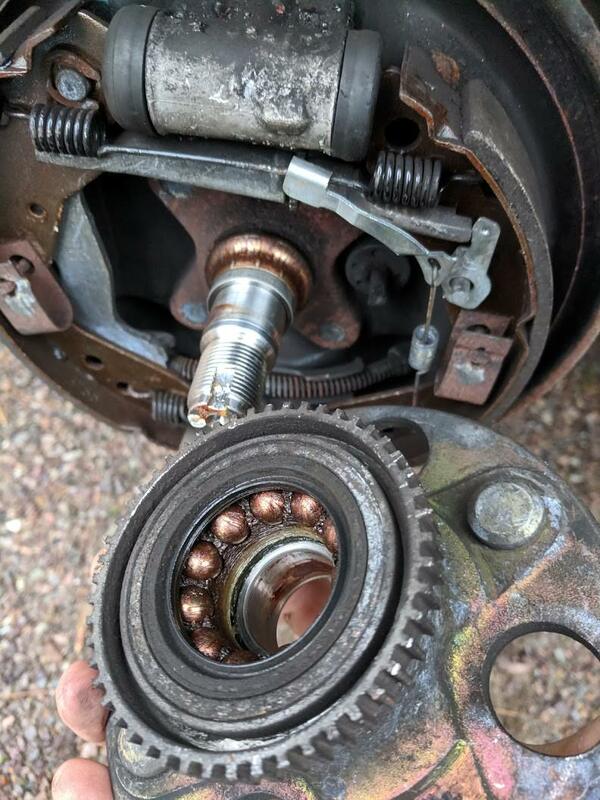 I realize this is the wheel I did a bearing on recently but it's possible I have some parts from the driver and passenger side flipped. I'm pretty sure the short arm should be under the end of the adjuster bar and the long arm under the spring and in contact with the teeth. I agree! Each time the parking brake is applied the adjuster should turn if needed. There should be a spring resting against the adjusting wheel for some friction also in most applications. Makes perfect sense. I was pretty sure when I took them apart several years ago, I put them back to how they were when I got the car, but I couldn't fathom how they were supposed to work when arranged like that. So, a few weeks ago I had my drums resurfaced because the shoes had worn pretty deeply into the sleeves (these drums are aluminum with steel or iron sleeves). After getting them back I noticed I still had brake pulsing and figured it was due to my front rotors being slightly warped rather than the rear drums, but turns out it's my drums. I haven't yet decided what to do. With the drums attached I've found that the brakes will rub only at certain spots on the drum when adjusted to where they barely start to rub, which tells me they're warped. My guess is that the shop removed material from the drums to resurface them, but that they didn't remove it hub-centrically. Or, maybe they warped again, because they're not as thick anymore. I imagine it's a lot easier to warp an aluminum drum than a steel one. So I'm thinking rather than spend more good money on fixing old drums which have already had material removed, I might just replace them. G1Parts has OEM drums available for $85 each. They weight 4lbs 10oz. These look to be steel. Weight isn't given. RockAuto has the Centrics listed above for $23 (each), which seems fair. However I believe the all-steel Centric drums weigh in around 9lbs, or roughly twice as heavy as the OEM drums. Unsure if I should just live with out-of-round drums, spring for new OEM drums, or try again with resurfacing and make the ones I have even thinner. With the drums attached I've found that the brakes will rub only at certain spots on the drum when adjusted to where they barely start to rub, which tells me they're warped. I've found that to be the case with most, if not all, drum brakes. It bugs me, but I've learned to ignore it. I would say buy the OEM item, even for a little more cash. Every little bit of weight reduction, espeically unsprung, is attractive. BTW, I think these G1 drums also fit the sixth gen Civics, IIRC. Is that your understanding? I want to say they're 225mm / 8.89in. I can't speak for the depth, but the wheel studs are the same.